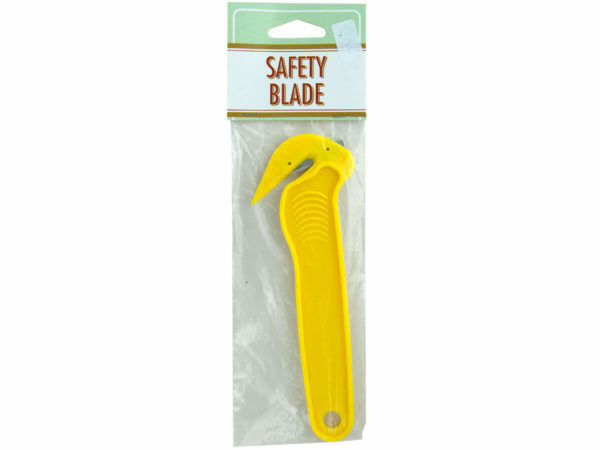 Easily cut through stretch film, shrink wrap and tape with this convenient Yellow Safety Blade featuring an angled cutter with an easy grip handle made of durable plastic with a metal blade. Unique design cuts while avoiding damage to protected items. Handle has a hang hole for easy storage. Measures approximately 6.5" long x 2.25" wide at the top. Comes packaged in a poly bag with a header card.